Clean eating. Low carb. Low fat. Do this not that. Now what? Eating is getting too stuffy and complicated. Throw open your windows to allow a new stream of health, wellness, and peace. Time to examine your dusty food belief knick-knacks. What if you could write a letter to food? Pen to paper, you hash out the love/hate relationship and food’s undeserving power. Details go back years, to your first childhood diet trying to fit in. How you relate to food chronicles many of your life’s ups and downs. In this letter, you examine your dusty food beliefs and wonder which go in the trash, are for others, and which remain in your heart. What if you wrote this all down and food wrote you back? This is Love, Food. 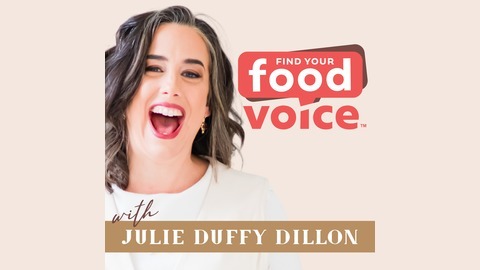 Food behavior expert and host, Julie Duffy Dillon is rolling up her sleeves to get to the bottom of what is really healthy. This award-winning dietitian seen on TLC’s My Big Fat Fabulous Life has a secret: food is not your enemy and your body is tired of the constant attacks. 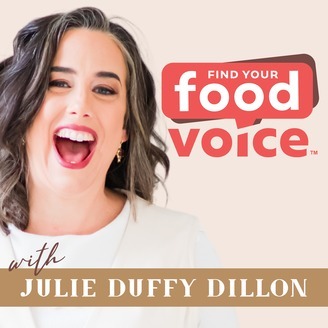 Show topics include: *emotional eating *weight concerns *binge eating *orthorexia *body image *eating disorders *dieting *parenting and food *healthy eating *stress eating *food addiction *mindful eating *non diet approaches Pull up a chair to your dusty kitchen table and set it for a meal. Ask food to sit alongside you and chat over coffee. Or a margarita. You have some reconnecting to do. In that connection is Love, Food. In that conversation is health and peace. Have you done the Food Peace™ journey for some time yet still find yourself emotionally eating? Are you frustrated that food still soothes you like nothing else?? Does it feel as though you are doing Intuitive Eating incorrectly because you can't just eat when hungry? Well, we have a podcast episode made just for you. Listen here now with special guest Heather Caplan RD from Lane 9 Project. This episode is brought to you by my courses: PCOS and Food Peaceand Dietitians PCOS and Food Peace. You CAN make peace with food even with PCOS and I want to show you how. I want to share the work going on within Decolonizing Fitness. The person behind it, Ilya Parker, is a trans person of color Physical Therapist Assistant and Medical Exercise Coachwith over 13 years of rehabilitative and functional training experience. He is a social justice advocate and educator whose work centers gender, racial and healing justice. (152) What if my recovered body is too big? (with Caroline Dooner).